Ohio’s State Highway Patrol is facing criticism after a man was attacked by a police dog as he Facebook live-streamed the moment his cousin was arrested for a missing license plate. Dannie Oliver, 36, who was a passenger in his cousin’s car, was accused of ignoring troopers’ orders as driver Samuel Tolbert, 31, was pulled over on Monday night. State troopers had tried to stop Tolbert at Copley Road and Bacon Ave in Akron, for a missing license plate on the rear bumper, but Tolbert did not stop until he arrived at Oliver’s home, two blocks north. The driver told troopers he did not know he was being followed until he turned at Bye St and Bacon. 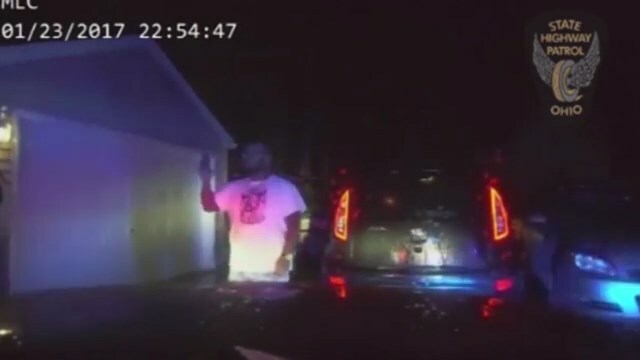 Dashcam footage obtained by the Akron Beacon Journal shows the trooper pulling Tolbert over and threatening to send the dog if he exits the car. Tolbert is seen getting out of the car seeming confused as a trooper draws his gun. The footage also shows Oliver using his phone to live stream the incident. In the three-minute video, Oliver is heard saying troopers arrived at his home and slammed Tolbert on the ground and pulled ‘guns and tasers’ on the two men. Tolbert is shown being walked to the squad car in handcuffs as he asks Oliver to call his mother and to get his ID card from the glove compartment. As Oliver obliged, he was immediately shouted at by a trooper who ordered him to get out of the car. The 36-year-old is heard explaining he was trying to get the ID for Tolbert, who he described as his cousin. ‘Hey, hold up, whoa! You ain’t got to grab me, dawg!’ Oliver is heard saying. Moments later, a police dog is heard barking before Oliver his heard screaming in pain as it bites its leg. ‘Hey, why’d you release the dog, man? Hey, this f***ing dog is attacking me! My f***ing leg! Get this dog!,’ he’s heard shouting. The trooper tells him to stop fighting the dog, which Oliver tells him he is not, before putting him in handcuffs. Oliver was charged with obstructing official business, and Tolbert was charged with obstructing official business, willful fleeing, a probation violation and drug abuse, according to reports. Dannie Oliver was treated in a hospital for dog bites. Apparently it’s less trouble to shoot blacks at traffic stops. They now have existing laws they can enforce,. Not sure if a missing plate is a reason for arrest though. Ahh what the hell, lawyers will figure it out on monday…lol.